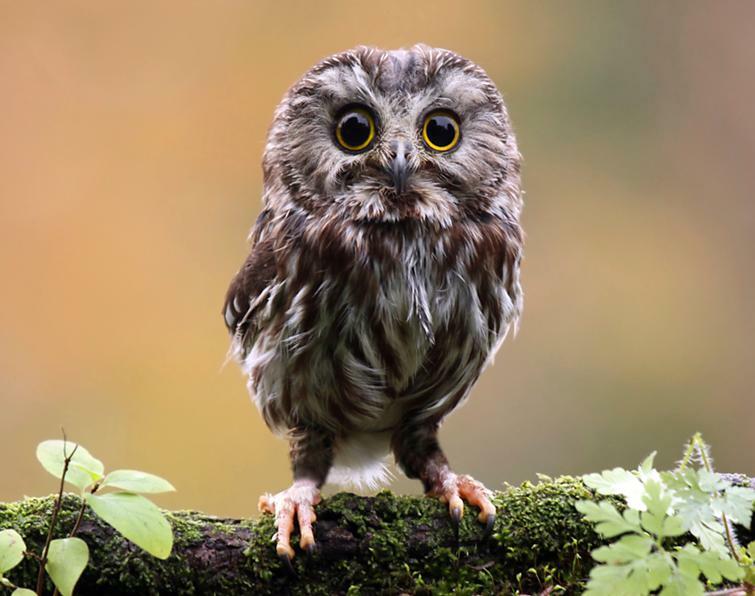 Length-7.50 to 8 inches; smallest of the eastern owls. Male and FemaleUpper parts dark reddish brown, the head streaked, the back and wings spotted with light brown and white; under parts white, heavily streaked with dark rusty brown; tail with three or four broken white bars; facial disk almost white, but blackened around the yellow eyes; legs buff feathered; no ear tufts; bill and claws dark. RangeNorth America at large, nesting from the middle states northward, and in western mountainous regions south to Mexico. SeasonChiefly a winter visitor in middle states; locally a permanent resident. Birds that prey on skulking mice must needs be night prowlers; but the theory has been seriously advanced that those owls which remain in sleepy seclusion all day, like the little saw-whet owl, are those that have suffered endless persecution from other birds whenever they ventured abroad in the sunlight, which is the reason they choose to hunt when others sleepan interesting theory, if nothing more. Nocturnal birds are naturally counted rarities, even where they are not. 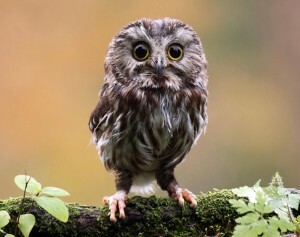 This little owl, by no means uncommon, is a very sound sleeper, and makes no sign of its existence, though one may be passing beneath its perch. So sunk in oblivion is it, and so heavy-eyed with sleep when roused, that many specimens may be taken with the hand. Hence the expression, “As stupid as an owl.” Because it is small enough to crowd on a woman’s hat, this is a little victim commonly worn, sometimes with wings and tail outspread, or again with only its head, like a Cheshire cat’s, appearing in a cloud of trimming. A woman who loudly applauded Dr. Van Dyke’s famous epigram, ” A bird in the bush is worth two in the hat,” at an Audubon Society’s meeting held in the Museum of Natural History, New York, in the winter of 1898, had the entire plumage of a saw-whet owl spread over her turban! At this same meeting another woman with self-righteous superiority was overhead boasting that she never wore birds, only wings, in her hats! Saw-whet, saw-whet, the love notes of this owl, most frequently heard in March and April, have a rasping quality like the sound heard in a mill when the file is sharpening the teeth of a saw; not an agreeable noise, perhaps, yet because of the ventriloqual power of the bird’s voice, and at the distance we think we hear it, it has a certain fascination. Dense woodlands, particularly evergreen forests, for it dearly loves a dark retreat, are where the owl passes its days; coming out at night, when its flight, surprisingly like a woodcock’s, has deceived other’s than Dr. Fisher into making a worse than wasted shot. Since it feeds almost exclusively on mice and insects, it is folly to destroy so valuable a bird. Mr. Nelson says that a dozen specimens have been taken in the most frequented streets in the residence portion of Chicago within two years. The majority of nests recorded have been deserted woodpecker’s holes, some in squirrel’s excavations, most of them near water, a few in stumps; but very rarely do the saw-whet owls appropriate an open nest, and more rarely still build one of their own.